Scottsdale’s most glamorous fashion series is comprised of luxurious runway shows featuring high-end, nationally and internationally renowned designer brands showcasing their newest collections. Past designers include Michael Costello, Michael Kors, Nicole Miller, Tory Burch, Ted Baker, Zhandra Rhoades, Laurel Dewitt, Trina Turk and Betsey Johnson, just to name a few. Scottsdale Fashion Week is the state’s most high-end series of fashion shows. It is a star-studded annual event with a calendar of activities sure to attract thousands of attendees. The week of events brings together designers, buyers, media, stylists, celebrities, VIPs and special guests. 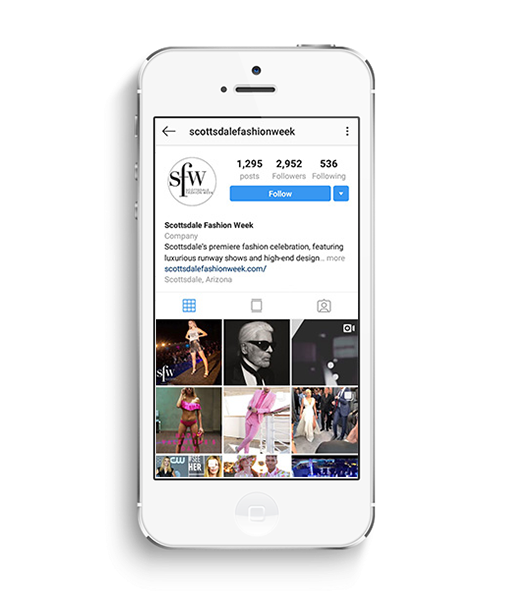 Scottsdale Fashion Week proudly brings both nationally and internationally recognized designers to Arizona’s runways, and features a variety of designers and brands. From swimwear to red carpet wear, and garments we only dream of wearing, Scottsdale Fashion Week features fashion shows that cater to everyone’s taste. Scottsdale Fashion Week’s collection of high-end, luxury designers is comprised of individuals and companies whose passion, vision and artistry bring to life exquisite, state-of-the-art pieces of clothing and accessories. SFW is thrilled to welcome to our runways a striking mixture of fresh designers and past participants.